And now, years later, I still enjoy doing "pro bono" work for those on a budget or those with a cause. By extending yourself and your professional services... Well, you just never know what may come of it! If you're a friend/fan/follower of this blog, you may recall I'm good friends with Paula Lucas and Jean Bates - Lucy & Leo's owners. When they decided to open up Tallahassee's first cupcakery, I volunteered to help out with their branding and web development. I did it for my friends, I did it for the cupcakes, I did it for the love of design and I did it for the sheer possibility that something great might come of it. 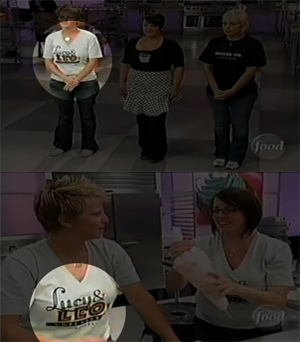 Aside from being one of my top client referral sources, Lucy & Leo's was recently featured on the Food Network's Cupcake Wars, bringing my designs in front of a national television audience. And if that weren't enough, I was recently profiled as a Full Sail featured employee for the effort. Situated in the center of the Full Sail Online building is the Education Media Design and Technology team, where we found current instructor Emily Wray, who began teaching here after close to 10 years of freelance consulting work. As a supporter of small businesses, Wray often worked on a free or trade basis with her clients while she was starting out. This allowed her to gain the referrals she needed to find more work from paying clients. Wray encourages others to support businesses they believe in, because even if you’re working for free, you never know how successful that business could become and who might end up seeing your work. That was the case for a gig Wray took on with the Tallahassee cupcake shop Lucy and Leo’s Cupcakery. The small shop that paid Wray in cupcakes wound up being featured on the Food Network’s “Cupcake Wars,” so Wray’s work on the branding and web design unexpectedly got a national audience.